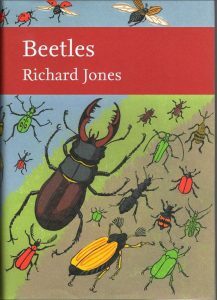 Richard Jones is the go-to person in the UK for beetles, and this book which germinated as a suggestion in 2014 eclosed as the most remarkable book on coleoptera four years later. It is the first on beetles in the New Naturalists Series which has been much overdue. With 4,118 species of beetle in the UK this indeed is mostly a UK-centric review of the richness of beetles, with occasional forays into beetles of the world where there are 1-3 million waiting to be discovered. Raised in the shadow of the South Downs with his current ‘manor’ of Sydenham Hill and Dulwich Woods, Jones introduction to beetles has not left any piece of dung, bark, compost, fungus matt unturned in his quest for his favourite prey. He has delivered excellent chapters on ‘What is a Beetle’, ‘Beetle Variety’, ‘Life Histories’, quirks, oddities, flight and general natural history. The fine morphological details remind one of Imm’s General Textbook of Entomology’. There are colour photographs throughout, which is always pleasing in these new NNS editions, especially so with Penny Metal’s superlative images. Species decline has inevitably caught up with Jones as there are species that he writes about that he has either never seen or rarely seen, Blaps ‘maybe on its way out’ or Platyrhinus – not seen – or oil beetles –only one seen. There is a large and very useful section on British beetle families each illustrated and fully described. A full index, references, keys and glossary complete this fabulous book which is to be recommended to all entomologists and naturalists.